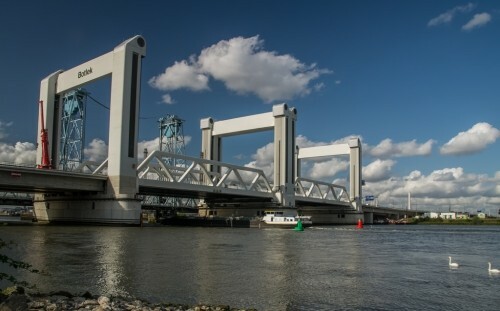 The existing Botlek – lift bridge was replaced by a new lifting bridge. The new bridge system is char­acterized by the world’s highest weight, the high­est stroke rate, and the highest lift speed. The lift height is 31 meters and is dealt with in a time of 90 seconds during the opening or closing opera­tion. The bridge is opened approximately once every hour, this lead to the relatively large number of 9000 openings per year. With a wingspan of 90m each and a bridge width of 50m the lifting weight is 4850 tons each. 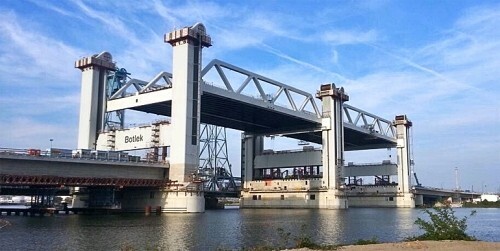 The lift bridge is part of a 36-kilometer long sec­tion of the highway in the west of Rotterdam. On the bridge, a double-track railway line is also per­formed in addition to four lanes including two emergency lanes.